What are your pickup and delivery hours? Choose a one hour window and we’ll be on our way. Do you offer pickup and delivery to both doorman and non-doorman buildings? Yes, we serve doorman and non-doorman buildings for no additional charge. Delivery is free to Doorman and Non-Doorman buildings for the entire Upper East Side (UES) from 59ᵗʰ to 96ᵗʰ Street, Fifth Avenue to the East River. We are starting free delivery service on the Upper West Side (UWS) from 59th to 110th Street, Central Park West to Hudson River, text us at 646.661.4777 for more information. For all other areas of Manhattan, delivery is free for orders of $100 or more. Smaller orders will incur a messenger fee of $24.99. Where do you offer pickup and delivery? Our window for pickups/deliveries is only one hour. To select your unique preferences and create an account with our website, click here. We can also setup your account by phone/text at 646.661.4777. For text, send a message that says “new customer” and we will take care of the rest. Yes! Same Day Service is available for Wash and Fold seven days a week. There is no additional charge for this service. We also offer same day service for Eco Friendly Dry Cleaning and Laundered Shirts Monday through Saturday. There is no additional charge for this service. What services do you offer for pickup and delivery? The answer is simple, if we offer it then we do pick up and delivery for it. This includes (but is not limited to) dry cleaning, wash and fold, shirt laundering, leather, suede, wedding dresses, and more. See a full list of our service offerings here. Yes! Our App and Register icon on our website guides you through the process of setting up your laundry, eco-friendly dry cleaning and laundered shirt preferences. 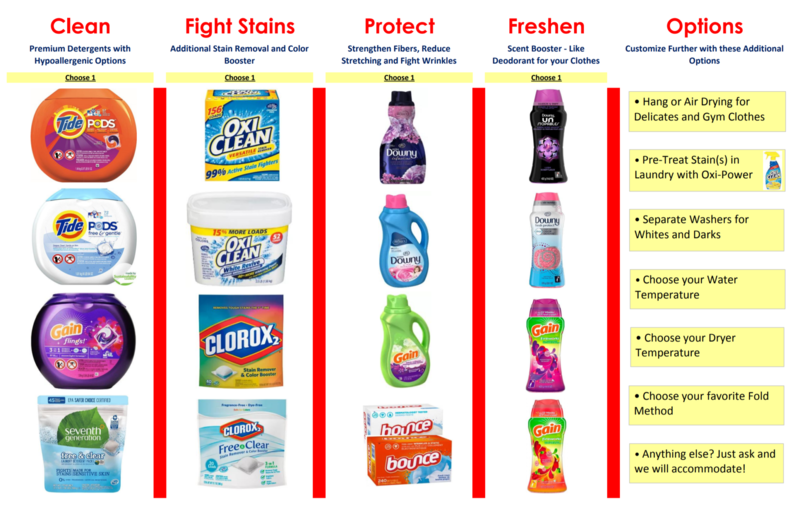 For a sneak peak at our new wash and fold laundry menu, click here . This allows you to have your laundry done your way; choose your own premium detergent, fabric protector, stain remover and scent booster. Allergy sensitivities? No problem. Other requests? Just ask. Do you offer Hang Dry with your Laundry Wash and Fold service? Yes, we do. Unlike some of our competitors, we offer this service with no limit. You have two choices; damp on hangers or our new service of air dry. This uses a specially calibrated dryer on our premises to use only air so that you receive your items back dry. It’s great for gym clothes and delicates. The cost per item of hang or air drying is 35 cents. Please separate these items in a separate bag or ask for one of our special red bags. All laundry is done in our own Laundromat at 242 East 77th Street. We nevery outsource your clothes or mix them in the same machine with anyone elses. Where is your Laundry Wash and Fold service done? Is it outsourced? Our laundry is done on our own premises by trained personnel at 242 East 77th Street. The average tenure of our staff is five years. We also promise never to mix your garments in the same machine with anyone else’s. Yes, it’s gross…but that’s how its done in most laundry facilities. New Yorkers are savvy enough to know that you get what you pay for. Enter code TLC1 in the promotion box when scheduling your first pickup with our app or online. You can also text us at 646.661.4777 when setting up your first pickup. Join our free loyalty program for Wash & Fold and Dry Cleaning. After ten bags of laundry, get one free (20lb max) and a free dress or suit dry cleaned after ten dry cleaning purchases of $20 or more. We can also setup your account by phone/text at 646.661.4777. For text, send a message that says “new customer” and we will take care of the rest. We are happy to assist with any questions that you have. Call or text 646.661.4777 anytime. Do you also operate a retail storefront? Yes! We ensure the safety of your credit card data, we will contact you via phone to obtain this information. Being family owned since 2006, we maintain Todd’s philosophy: Treat your employees well, and they will treat customers well. Most of our employees have been with us since Day 1. Stop by our store at 242 East 77ᵗʰ and see for yourself!